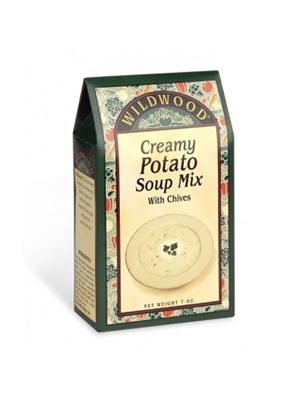 Wildwood's Creamy Potato & Chive Soup mix is one of their best sellers. It is a seriously easy to make comfort food. Enjoy with a side salad and a slice of warm bread. Whisk contents of package into boiling water. Boil rapidly for 2 minutes. Reduce heat to low, simmer and bubble for 25 minutes, stirring frequently. Bring 4 cups water and 2 cups chicken broth to boil. Reduce heat to low, simmer and bubble for 20 minutes, stirring frequently. Add one 6.5 ounce can minced clams with juice and 3/4 cup frozen corn. Continue to simmer lightly for 10 minutes - clams will be tough if over cooked. Cream base, potatoes, chicken broth, onions, carrots garlic, chives.